I would like to thank Michael from Fidue for providing me a review sample in return for my honest opinion. Fidue is an established player with a loyal following, having made their mark in the entry level regions of the audiophile market with popular products like the A83 and A73. Now that they’ve conquered that market, it’s time for a step up. After years of intensive research, Fidue presents their new flagship: the A91 Sirius. I didn’t get wind of any mission statement from Fidue about their new flagship. Something like ‘Fidue is challenging the status quo in the sub $1000 segment, with high quality sound for an affordable price’. I mean, something like that would make sense coming from a manufacturer that comes from operating in the lower regions of the audiophile market. But they didn’t have to. It’s visible in the product, and their choice of tuning – a well thought out signature that shows a certain refinement, and is very easy to listen to. I’ve had a couple of 4+1 hybrids in the same price range in the past, and none of them really pleased me. They all felt like they were trying too hard, and lost a certain bit of refinement compared to the TOTL’s they were trying to be. With the Sirius, it’s different. It isn’t tuned to impress you with powerful bass, a forward midrange, or sparkly treble. Instead, the Sirius convinces with a smooth and balanced signature. It knows what it can do, and it does it with class. I personally wasn’t a big fan of the A83’s looks, the red and blue plastic had more of a toyish feel than the allure of a high end product. How different with the Sirius – it truly is a masterful piece of design. The metal housing feels solid, and is in a distinguished dark gray color. It’s finished off with a slim silver lining around the edge, that I hadn’t noticed at first. Seriously classy; these have got to be one of the most beautiful universals I’ve seen. They are a bit on the larger side; I have medium/small ears so they fit me snugly, almost filling up the space like a custom. But I get the feeling my ears shouldn’t have been much smaller, especially at the bottom corner. I get a good seal with the standard tips, but the bores don’t protrude very deep in the ears. I might have preferred to see them go a bit deeper, but overall I don’t really have any complaints about the fit and especially design. The cable connectors are MMCX, which I haven’t been much of a fan of in general due the sound cutting out on a regular basis with previous iems. But with the Sirius there’s an additional screw in red or blue to further fasten the cable. The system works well and feels solid, while ensuring a secure seal. The Sirius comes in a matte black cube-shaped leather case that reminds me of the nice cases you get with high quality daps. When you open the lid, the shells are presented on the first layer with four pairs of tips pressed against bores in the case, along with a separate pair of complys. It further comes with some standard accessories like a ¼ inch and airline adapter, and a hockey puck style case I’ve been seeing before with the Galaxy and Primacy. The one that comes with the Sirius is a bit more ornamental, with some nice curves compared to the straightforward design of the others. But similar to those, it’s more functional as a storage unit for tips or random items floating on my desk, than as an actual carrying case for on the go. But Fidue has packed along something really special: a modular system to use the Sirius with both balanced and regular sources. 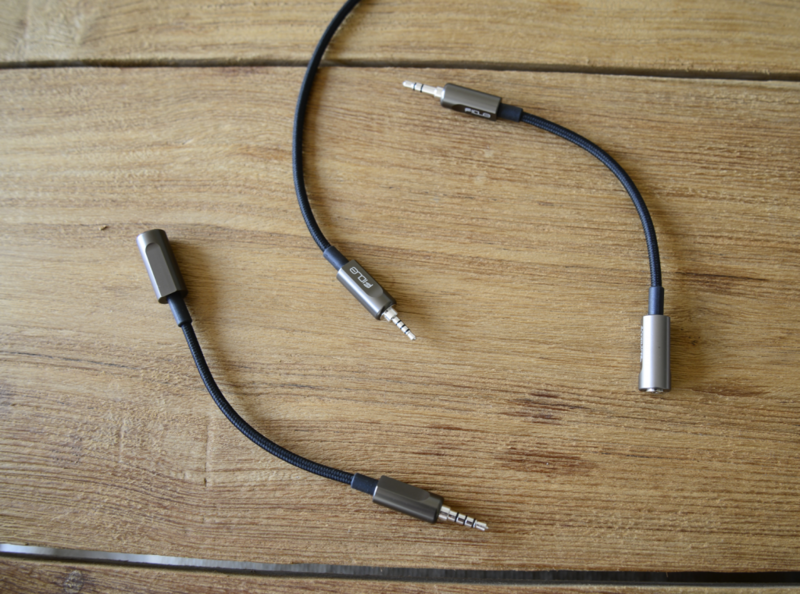 The cable is terminated in a 2.5 mm trrs jack for daps like the A&K or Onkyo players, but it comes with two adapters: one for balanced 3.5mm trrs players like my Plenue S and 901S, and a regular 3.5 trs for the rest. Balanced outputs are gaining in popularity, and alongside the high end daps more and more midtier sources have started to incorporating balanced outputs. It’s becoming the standard rather than exception, so chances are the modern audiophile will have one or more balanced sources. Incorporating the modular system saves having to buy a separate aftermarket cable, which would then be restricted to that source only. How thoughtful, and incredibly useful. 10/10 for the selection of accessories, I can’t think of a better total package I’ve come across. But the modular system also comes with a downside. As is, the cable is already on the thicker side, especially below the Y-split. It’s a cloth-sheathed 8 core cable, and while beautiful, is also a bit heavier than a regular cable. The weight of the cable isn’t an issue for me, as I have an unnatural passion for 8 wire cables. So I’m used to it, and like the heavy feel as I associate it with quality. But since I have either regular or balanced 3.5mm outputs, I always need to use an adapter. The rhodium-plated plugs have a high quality look and feel to them, in the same color as the dark gray shells. But while the cable itself isn’t that heavy, the extra length and weight of the plugs tends to pull a bit while wearing them. So all in all the modular cable is a big plus, that comes with a slighter con. I’m sorry it couldn’t live up to your standards. Can you compare Sirius A91and earsonics Velvet? How do they fare against Perfect deal AR6/deca? I’m more keen on learning the comparisons of staging, imaging and instrument separation. Please excuse my late response, didn’t notice it for a while. The Velvet has an opposing signature, with a laidback midrange and enhanced treble and bass. The Velvet’s midrange is distant and a bit hollow in comparison to the more forward and warmer midrange of the Sirius. It does however offer more clarity and excitement in the upper frequencies. The Sirius sounds a bit warmer/darker, with a more emotional tone for instruments and vocals. Both have wide stages, though not particularly deep. The A91 has a bit taller stage, but this is going off memory. Velvet was more of a flat/wide stage. Simply put, I’d highly recommend the Velvet for V-shaped genres like pop, hip hop, electronic music. I’d go with the Sirius for instrument-based and vocal music. The AR6 and Deca have a more neutral tuning, with a lighter/clearer sound, as they peak in the upper midrange around 5 Khz where the Sirius dips. All of them have a nice stage, with the AR6 having the most spacious and airy sounding stage, and the A91 and Deca being more similar in proportion. The Deca has a very natural tonality, but is a bit soft in the mid treble region, so it’s not necessarily pin point analytical precise when it comes to imaging. Going off memory, I’d say the AR6 has an advantage in its stage and separation, it was a discerning feat. But it was quite a while since I heard it. I’m sorry if this question is a bit weird. If you had to live with one IEM to fulfill all your music needs taking into account all your personal preferences (tonality, staging,comfort, source dependency etc. ), in what ways would the perfect seal AR6 be deficient? And which is that one IEM you would choose? Well it’s a perfectly normal question 😉 The AR6 was too light on bass for me. I’m not a basshead, but I do appreciate bass a little bit north from neutral; nice sub-bass impact, and a mid-bass that gives some rhythm and fullness to the music. The AR6′ bass extends deep, but for iem standards it was below average in quantity. It’s hard to pick one as I listen to very different genres, and in most case an iem is a bit of a specialist for one but performs worse on others. I like Zeus-XIV and the NT6pro, they’re kind of opposites. I’m currently listening to Deca, is a very natural sounding ciem with more mid-bass quantity than the AR6. Andromeda is a nice allrounder at an honest price. Glad to help, let me know if you have any more questions. Can you compare earsonics Velvet and Sirius ?